After I was able to do make one of them, I made 75 roses from paper 15 cms x 15 cms for each flower. 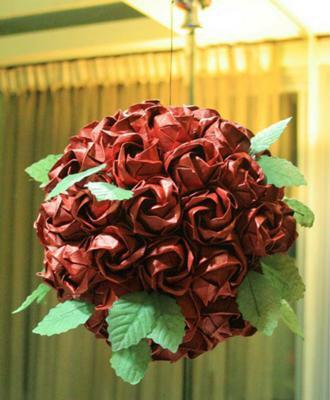 I put all roses to a plastic ball and put on artificial leaves. I hang it in my home. "Dozen Roses for you to celebrate Christmas"
They look just like real roses! If you put perfume on them no one will know they are paper! I am an origamist myself and I think that is amazing! If there was a way to connect them with only paper that would be awesome! The ball of roses looks super great. You did a wounderful job keep it up. Teach me how to make it! Teach me how to make it! teach me teach me how to make it! I LUV IT! PLZ TEACH ME! wowowowowowowowowow! I wish I had origami talent like you! but.. I am only 11 so i guess I'll have to try harder to be better than you! This is an extraordinary art. How many days did you create this? Can you teach me Kevin? I like these origami and imagine if able to make thousands of roses for celebrating my valentine.